I am very excited to be reviewing this album. 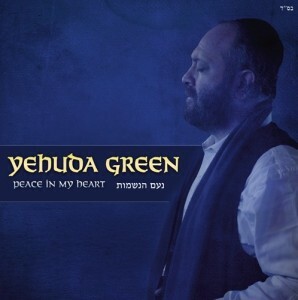 I have been a very big fan of Yehuda Green’s since he started out in the Jewish Music world. I even had the privilege to sing alongside him during the Catskills Summer Concert Series produced by Green Apple Productions. You can take my word for it, he is an inspiration to those offstage AND on! Now it time to begin the review! 2.Birchas Hachodesh- Keeping with the tradition on other Yehuda Green Albums, we are given a taste of how R’ Shlomo Carlebach would daven. W’ve heard Kiddush, Havdallah, and Now Birchas Hachodesh. 4. I love the intro to this song. The string arrangement is awesome! This song is another composed by R’ Shlomo (notice a pattern?) this is yet another song that fits into the category of a song that just goes directly into your head and tells your body to dance. 5.Kah Echsof – This song was composed by both R’ Shlomo Carlebach and Yehuda Green. I find that out of many artists in the Jewish Music world, there are few that have songs that fit with the words. Yehuda Green is one of those artists who really expresses the words he is singing with the song. Not that the tune is just a vehicle to get the words to you. This song is one of those where there is a relationship between the words and the tune. 6.Od Yishoma – When I see these words on an album I worry about hearing another generic wedding song. This song composed by Yehuda Green and Legendary composer Yossi Green (I don’t believe there is any relation) shatter that fear. this song gives me a feeling that this may have been one song that R’ Shlomo didn’t get a chance to compose. 7.V’chol Mi – Thia is a very nice song composed by none other than Yehuda Green himself. I dont honestly have anything specific to point out in this song other than it being a nice relaxing song. 8.Shirat Hayam – I assume that Yehuda had the title in mind when he composed this song. Replace the guitars and drums with harps and tambourines and this song might be very similar to the actual Shirat Hayam. It definitely has the bounce of such a happy song. 10.Eloka Di La – Another classic Yehuda Green/Shlomo Carlebach song. I very much enjoy how consistent Yehuda is with his voice. He never feels the need to hit ridiculous notes every 4 bars of every song. He seems to keep his voice very consistent on this album in general, and the truth is he is live as well. 11.L’mikdashcha – Just like the first song on the album, this song starts of with more of a Chazzanish’e piece and then gets more upbeat. I think the violin fills are perfect for this song. All in all, if you’re looking for something techno-y this might not be your album. If however you are the kind of person that enjoys the spiritual side of music and maybe a good Kumzits here and there, there’s a very good chance you will enjoy this album.